George Levi Magerkurth (December 30, 1888 – October 7, 1966) was a professional baseball umpire who worked in the National League from 1929 to 1947. Magerkurth umpired 2,814 major league games in his 19 year career. He umpired in four World Series (1932, 1936, 1942 and 1947) and two All-Star Games (1935 and 1939). Magerkurth also played in one game for the Rock Island Independents of the American Professional Football Association in 1920. Magerkurth started out as a minor league catcher, getting trials Hannibal, Rockford, and Duluth in 1907 and 1908. He played for the Kearney Kapitalists in 1910-1911. 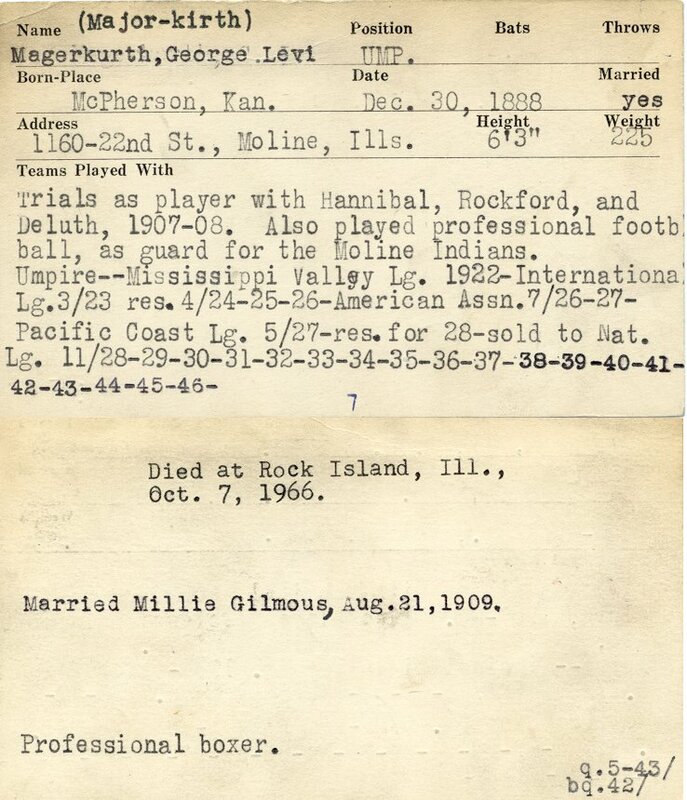 After working in a factory job, he played football for the Rock Island Independents in 1920 and became a minor league umpire in 1922. Magerkurth umped in the Mississippi Valley League in 1922 and the International League in 1923. He also worked in the American Association and Pacific Coast League before moving up to the NL in 1929. After leaving the NL, Magerkurth umped in some college semi-pro games, and was a baseball commentator for a Moline, IL TV station.